This dress is created from the calmness that identifies our firm. Made of silk muslin embroidered in velvet with satin lining. An overlapped neck finishing in a pleated sash clinging to the waist together with the flowing sleeves pleated in the shoulders and the buttoned cuffs, create a perfect and balanced silhouette. Dress made in neoprene crêpe with a v neck giving way to a line of golden bouttons that finishes in a central vent. This model complies with three basic concepts in our firm: simplicity, elegance and comfort. It's a perfect choice for any occassion . Stretch silk dress with tight fitting bodice and sleeves with shoulder pads, wonderful v neck on the back where a line of three buttons lined in velvet gives way to a bow of gauze embroidered in velvet. Combine it with our clutch Ginger for a dinner and with our pamela hat Agnes for a wedding. 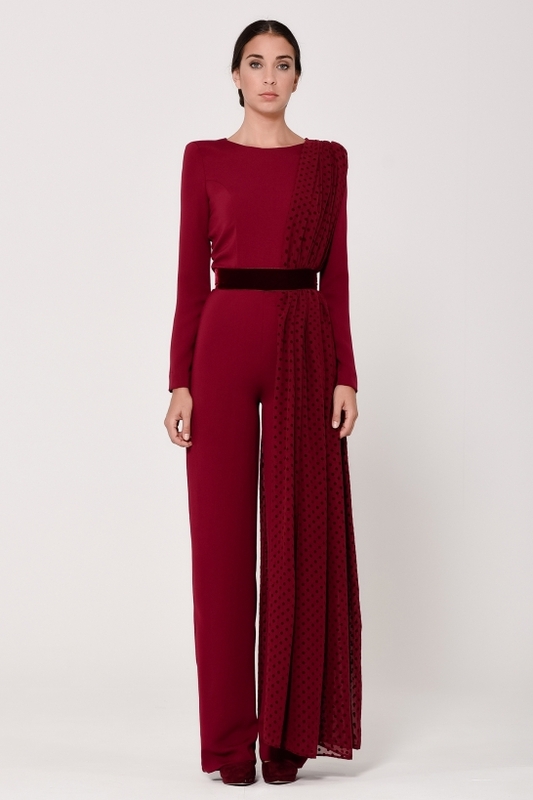 Silk crêpe jumpsuit tight to the body and closed on the back with an invisible zip. Velvet ribbon around the waist. Long straight trousers that creates a soft movment thanks to the fabric. The originality comes given by its half cape over one shoulder. This is made in muslin embroiderd in velvet. Long party dress made in a muslim embroidered with velvet spots. Its wonderful pleated v neck ends in a velvet bow framing the waist. The skirt opens on the front, creating a unique dress. Long sleeves and zip closing on the back. Perfect choice for your autumn-winter events. Midi dress in stretch velvet, drop shaped neck and lovely bow on the front, defining the waist. Back and sleeves softly tight to the body. Be ready to shine. Blazer style dress with long sleeves and shoulder pads. It closes at the front with two golden buttons that provides it with a vintage look. V neck and asymmetric glossy lapel. Midi length dress inspired in the 40s due to its full skirt. It's remarkable the design with sleeves pleated on the shoulders as well as its v neck giving way to a line of buttons lined in velvet. The delicacy of this garment contributes to its vintage style that prevents its going unnoticed. Silver crêpe dress with a classical design and round neck. It closes with a back invisible zip. Inside lining and back vent. It's remarkable its long muslim bow on the shoulder. Our Gardner dress is a good option for this season. It possesses a touch of sobriety, and together with a great pamela hat, it will transform you in the perfect guest. Midi length dress with pencil skirt tight to the body and deep v neck on the back. The charm of this garment is given by its sleeves embossed on the pad shoulders and with buttons in the cuffs. It's a perfect basic wardrobe to be used in any occassion. Midi length dress with pencil skirt made in stretch silk with drop shaped neck pleated to the waist, which will be perfectly defined by a lovely bow. This garment is lined with the same fabric in order to enhance the feminine silhouette. Jumpsuit in neoprene crêpe with tight sleeves and pletaed shoulders, its v neck gives way to a line of golden buttons. Its back closes with an invisible zip. The straight and classic trousers have two side pockets framed with golden buttons as well.